Some readers will know that the work of Down Syndrome Education International began in 1980 as a result of the observations of a parent. In 1979 Leslie Duffen wrote to Sue Buckley about the progress of his daughter Sarah, then 11 years of age and attending a mainstream school. Sarah was making exceptional progress for a child with Down syndrome and Leslie felt that a major reason for this was her early reading experience. He had introduced her to reading from the age of 3 years and he felt that she had learned to talk from seeing rather than hearing the language. Sue and her colleagues began to research Leslie's suggestions and found that they were able to teach a sight vocabulary to preschoolers with Down syndrome and that it did help their language and cognitive development in the way Leslie predicted. Twenty years on, research from around the world has demonstrated that children with Down syndrome do indeed have specific difficulties in learning from listening due mainly to hearing, auditory processing and verbal short-term memory difficulties. These difficulties will significantly impair their ability to learn their first language from listening and, in turn, language delay leads to increasing cognitive delay. Our experience leads us to believe that reading is one of the most powerful ways of helping children with Down syndrome to overcome their speech, language and cognitive difficulties. In particular it develops their grammar and speech production abilities at the optimal time in brain development. However, many professionals working in early intervention services are still not aware of the importance of early reading activities, so many parents and children do not receive the help and advice that they need at the preschool stage. Parents and teachers in other countries have also been discovering the power of print for children with Down syndrome and we include here some examples of the progress of children in the USA (example 1 and example 2), New Zealand and Turkey described by their parents. We hope that these examples will encourage parents, speech and language therapists, early intervention and preschool staff to realise the benefits and importance of early reading activities. These children were all taught by their parents and we hope that everyone will see that no special knowledge is required. We have recently published a guide to teaching reading to preschoolers  and we have made several videos in recent years which show children with Down syndrome engaged in reading activities to encourage everyone. No special knowledge is required - every parent teaches their child to talk, and using reading to teach talking just follows the same principles, with the use of print. At the end of these features on early reading we include a summary of a recent research study which compared the reading skills of preschool children with Down syndrome and preschool typically developing children of the same chronological age over a three year period. Both groups learned initial sight words at the same rate, and progress after 3 years clearly demonstrated that reading ability is a strength for many children with Down syndrome. Reading and writing development for infants with Down syndrome [DSii-07-02] by Gillian Bird and Sue Buckley, published by Down Syndrome Education International, see Reading resource list below. Reading videos, see Reading resource list below. 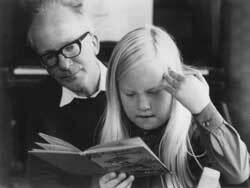 Teaching reading to children with Down syndrome - a guide for parents and teachers. By Patricia Oelwein. ISBN: 0-933149-55-7. Reading Skills in Pre-school Children with Down Syndrome. By Elizabeth Wood and Sue Buckley. (1983). Portsmouth, UK: Portsmouth Polytechnic. The Development of Language and Reading Skills in Children with Down Syndrome. By Sue Buckley, Maggie Emslie, Gillian Haslegrave, and Pat Le Prevost (1986). Portsmouth, UK: Portsmouth Polytechnic.